BUBEN & ZORWEG is widely known as a maker of fine safes that come with the very best craftsmanship. 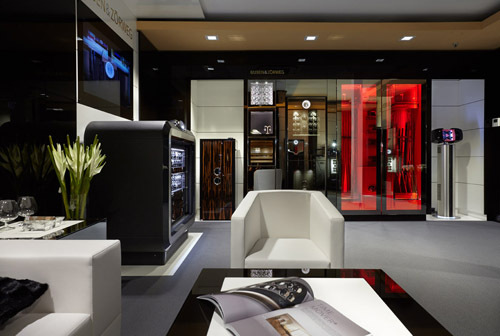 The luxury safe brand has opened a luxury VIP Lounge in Zhukoffka Plaza, Moscow. The new BUBEN & ZORWEG VIP-Lounge in Moscow is a unique concept to arrive in Russia. The luxury lounge was designed with only the best materials and features in mind. You’ll find a special Weapons Safe room that has mirrored surfaces that can become transparent based on your wish. To gain access, you must utilize the state of the art fingerprint scanner to gain entry to the room.protected inside. “Zhukoffka Plaza” is the most affluent residential quarter in Moscow and was chosen for this VIP lounge because it offers a wide selection of world-class luxury brands, all in one place. You’ll find top interior decoration brands such as Hermès, Christofle, Etro Homme Collection, Ralph Lauren Home, Saint-Louis, Pratesi, A. Raynaud & Co, Phyllis Morris plus numerous other luxury brands. BUBEN & ZORWEG was founded in 1995 and since, the luxury company is often the first choice from customers desiring fine timepieces. Collectors and connoisseurs also appreciate the offering of precious rarities. The line of luxury safes from the House of BUBEN & ZORWEG feature luxurious interiors plus superior design. The goal of most customers is to safely protect their precious objects in addition to having the opportunity to display their prized possessions. ZORWEG Luxury Safes have long been desired due to their unique design plus high-end security solutions. In addition to the company’s highly rated security safes, visitors to the new VIP lounge in Moscow will discover a selection of the best furniture, jewelry, house accessories, clothes, gifts in addition to other items of the highest quality. For obvious safety concern issues, most BUBEN & ZORWEG customers would prefer to remain anonymous. But there are several famous celebrities who are proud to own a highly secure safe, including: Angelina Jolie, David and Victoria Beckham, Michael Schumacher, Jennifer Lopez and Arnold Schwarzenegger. If you are interested in purchasing a high quality luxury safe from BUBEN & ZORWEG, please contact The Life of Luxury and we can assist with the buying process. Like reading about the latest luxury trends? Then return and follow this luxury blog.